CIRC is uniquely positioned amongst UK race car builders in being able to offer a complete technical design service. 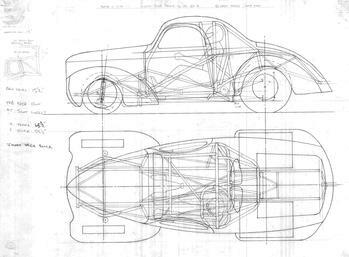 Whether you are looking for chassis blueprints, suspension analysis or even body designs, we can provide a solution to suit your needs. 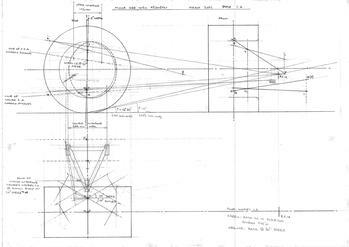 Scaled chassis drawings are a CIRC speciality, and can prove a useful starting point for someone contemplating a home build. Naturally, we can provide all materials, parts and sub-assemblies such as suspension links, etc. to support our DIY customers. 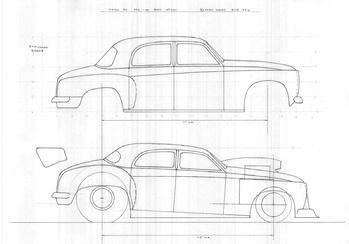 Feasibility study for a proposed Rover P4 Pro Modified drag race body. If you have a 'what-if' idea, we can help you bring it to life! On the left is part of a paper design for a double wishbone front suspension system, whilst on the right the same system is put through a range of dynamic movements on our CAD analysis program to not only fine-tune the design but also to give a good starting point recommendation for camber and caster. We can design your suspension system from scratch, or analyse what you already have and recommend any improvements and their effects. 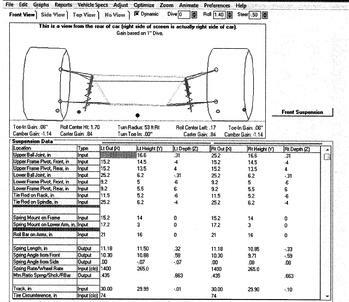 Written reports can also be provided on any new or existing suspension setup.